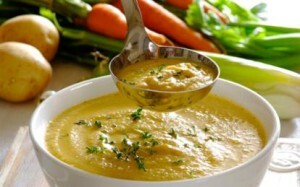 5.Using a hand blender blend to preferred thickness – for a chunky soup give it a quick whizz. For a smoother mouth feel blend well. 6.Tip – don’t spend too much time chopping and dicing the veggies perfectly as you are going to blend the soup at the end!